Dr Winston Davis, president of the Bahamas Veterinary Association says pet owners who believe they are giving their dog a treat by throwing them table scraps bones could actually be causing unintended consequences – cooked bones break down and become brittle, posing potential danger that too often ends with unvoiced pain or even emergency surgery or worse. 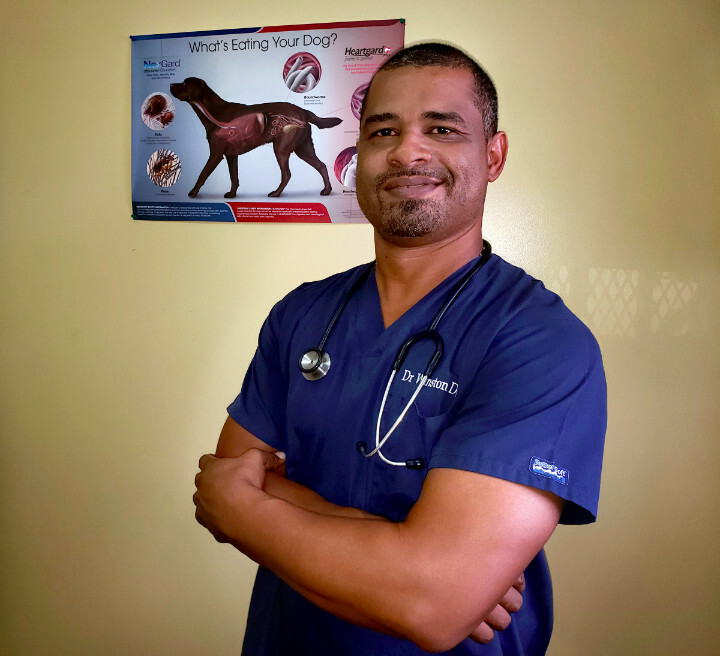 It’s a piece of advice that runs counter to the bone-loving dogs the mass media has for generations depicted – cooked bones from table scraps can be harmful causing injuries or even fatalities, according to Dr Winston Davis, president of the Bahamas Veterinary Association. “I recently had a case of a three-year-old male dog presenting with vomiting and severe abdominal pain and trying to defecate. From his history, we found out that he was fed pig’s feet a few days prior but was fine after eating it,” said the veterinary practitioner with a decade of experience in improving the lives of animals. An examination revealed an elevated temperature and a very dry mucous membrane – an indication that the animal was in all likelihood mildly dehydrated. The dog was bloated and on abdominal palpation (hand examination) there was severe abdominal pain. 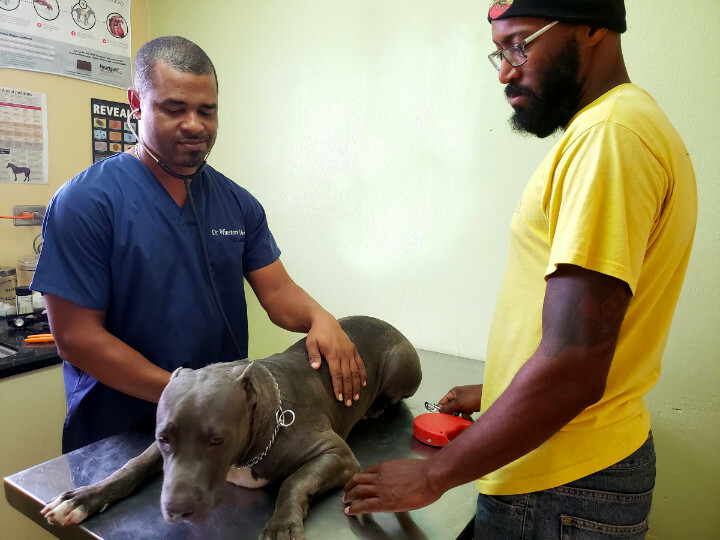 “Radiographs were done and showed what we suspected,” said Dr. Davis, proprietor at the All Creatures Animal Clinic, a full-service veterinary hospital in Nassau specializing in dogs, cats and other domestic species. At his Soldier Road clinic, Dr Davis executes a routine examination of a patient as the pet owner looks on. Treatment in this case was immediate – surgery to remove the bones from the stomach and small intestines. The dog remained in hospital for about a week on meds and fluids. “This case was one that caused severe pain for the dog and could have been avoided,” said Dr Davis. In the Caribbean region, 54 per cent of pet owners feed their animals table scraps at least once per day, according to research conducted by the Washington, D.C.-based Pet Food Institute (PFI), an association whose members make 98 percent of all U.S. dog and cat food products, and is committed to education and awareness of the importance of pet nutrition and wellness. According to Dr Davis, informed pet owners are the key to healthy, happy pets. “Finding the right food to meet all of your pets’ requirements use to be challenging, but nowadays packaged good quality pet foods are available in pet stores, corner stores and supermarkets,” he said. Still, he recognizes that even with a wide-variety of nutritious food available for a balanced diet, some pet owners still add cooked bones from table scraps to their canine’s meals. Leftover bones from human food can lead to constipation, internal bleeding, intestinal blockage, choking and chipped teeth. Especially dangerous are cooked pork bones, including spare ribs, as the bones become brittle and can break off internally, scratching or scraping delicate organs. Research suggests feeding table scraps to pets could lead to severe nutritional deficiencies, digestive issues and a poor fur coat. Commercially available treats and chews can help to strengthen the bond between pets and owners, reward good behavior during training and provide long-lasting entertainment. PFI suggests when giving pets a treat or chew, it is important to ensure they are no more than 10 percent of the animal’s daily calories, and to always monitor pets while he is enjoying the food to avoid any choking hazard. The Pet Food Institute reminds pet owners that Fido cannot tell them what hurts and Fifi has no way of expressing something is wrong so owners have to double their dedication to doing the right thing for the pets that are so much a part of the family. PFI publishes a list of harmful foods including chocolate, onions, grapes, raisins, macadamia nuts, nutmeg and avocados. These may be safe for human consumption, but deadly in higher doses to pets leading to thousands of emergency surgeries throughout the Caribbean region alone. As the voice of U.S. pet food makers for nearly 60 years, the Pet Food Institute provides factual information about pet food safety, nutrition and health to pet lovers, and acts as advocates for a science-based regulatory environment. Its members collectively produce 98 per cent of all U.S. pet food and treat products and are committed, along with vets, to recommending food that is scientifically tests and made from approved ingredients.